We spent a few weeks evaluating the best rolling backpacks for children. 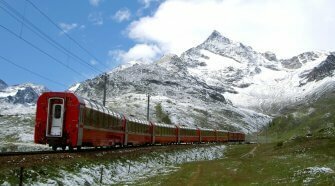 We were looking for the most durable, useful, and fun option to recommend for elementary and middle school use, as well as for short overnight trips. We looked at the wheeled kids’ backpacks from both well-established and rather unknown brands. One of the most important factors was the backpacks’ ability to withstand the trials and abuse of accompanying a kid day after day, year after year, through all kinds of wet and dirty environments. There are many poorly built backpacks on the market, and we wanted to recommend only what would stand up well over time, protect schoolwork, and come with a guarantee from a company with a history of follow-up. The best rolling backpack we’ve found for kids is the L.L. Bean Rolling Deluxe Book Pack. It wraps their school stuff in the weatherproof, rip-resistant, flexible 420-dernier nylon that was originally designed for military parachutes, and the backpack’s stitching, wheels and zippers are similarly built to last — and backed by L.L. Bean’s famously generous guarantee on materials and craftsmanship. The reflective trim improves safety at night. The pull handle locks into place at two points, making it comfortable for 10-year-olds on up to looming high school kids. 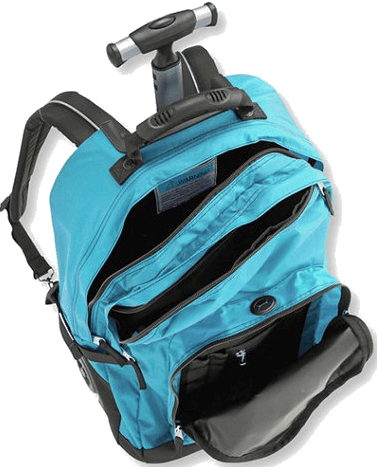 The backpack straps tuck away when not in use to avoid snagging. There are dual main compartments allowing for the separation of, say, gym socks from textbooks, as well as a front organizer pocket for pens and small electronics, with a key hook and headphone port. While we also have a few cheaper recommendations (below), we think the wheeled option from L. L. Bean is well-worth the slightly higher upfront investment due to its likely longevity. With apologies for the obvious pun, kids have a lot on their shoulders. Schools pile on textbooks, workbooks, and take-home projects, and some kids also their share time between different households (with separated parents, grandparents, babysitters, etc.). And there are after-school activities with their accompanying equipment, as well as the fun stuff that kids like to tote with them through the day. The load can build up —and it’s not healthy. There is excellent research showing that when children carry heavy backpacks they often develop problems like low back pain, compressed lumbar discs, and asymmetry. Such childhood back problems can then lead to worse issues in adulthood. In addition, heavy backpacks harm joints and contribute to falls — over 6,000 child emergency room visits in 2016 were for backpack injuries. The American Academy of Pediatrics recommends rolling backpacks for kids carrying a heavy load. All that said, rolling backpacks can be a tripping hazard in more-crowded school hallways. Kids who use rolling backpacks need to understand that as fun as it might be to roll them, there are situations where it’s necessary to use the backpack straps. We prioritized durability in our considerations, followed by features like reflective trim and organizational pockets. We found that the L.L. Bean Rolling Deluxe Book Pack had just about everything we could ask for. Almost all other children’s backpacks are made from polyester fabric, mainly 600D polyester, which has the advantage of being cheap, light, and easy to dye many colors, but it is not as strong as the 420D nylon used for the body of L.L. Bean’s rolling kids’ backpack.1While D or “denier” is a measure of density of the fabric, it is only relevant as a measure of strength among the same types of fabric — and not when comparing different fabrics to each other. As we mentioned, 420D nylon was originally designed for military parachutes. And the 1680D ballistic nylon that is used for the bag’s base is even tougher — in the pre-kevlar days it’s what soldiers wore to protect themselves from shrapnel. Kids, do your worst — this fabric won’t rip. All of this wouldn’t mean much if the stitching, zippers, handles, and wheels weren’t similarly built to last for the long haul, but they are. L.L. Bean kids’ backpacks have consistently topped durability tests from consumer organizations and in press reviews, which showed for instance that the zippers held up over time and the handles didn’t tear in jerk tests. The fabric is treated to repel moisture, and zippers are protected with flaps, also improving water resistance. 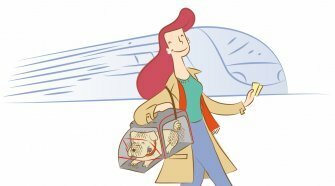 In sum, a child’s precious papers should survive even when the bag is caught in a downpour or plopped down in a mud puddle. The bag’s 32L capacity is a wee bit larger than other kids’ rolling backpacks; it’s fair to assume that anyone wanting wheels may regularly have a bulkier load. There are two separated main compartments. The front organizer pocket offers storage for pencils, pens, a phone, a key fob, and a small hole through which a headphone cable can be threaded. The 3M™ Scotchlite™ reflective trim on the bag’s front and back makes the bag highly visible from any angle at night. The pull handle can be tucked neatly into the unit or locked in place at two different heights, improving comfort an ensuring that a child won’t grow out of the bag. 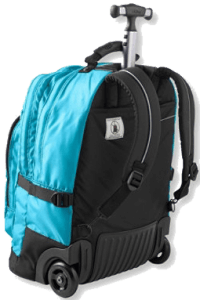 The well-padded backpack straps can be tucked into the back compartment. It’s a bit larger than the other options. While most kids who want a rolling backpack are by definition carrying a lot of stuff, if you want to discourage overpacking you can check out any of the slightly smaller options below. There is no laptop sleeve. See the JanSport option below if your child regularly carries a laptop. It’s a bit expensive; for a small step down in quality and price check out the Lands’ End option below and for a larger step down see the J World options. We think L.L. Bean’s durability is well worth it, however. There is no water bottle sleeve, unfortunately. This is an option on many of the bags below — although the mesh water bottle pockets are generally the first thing to wear out and often don’t last through a full school year anyway. The Rolling Deluxe Book Pack is sold directly from L.L. Bean and is available in bright blue and dark grey, with an $8-option to add a monogrammed name in any color. It measures 19 x 14 x 9.5 inches (48.3 x 35.6 x 24.1 cm), has a 32L capacity, and weighs 32 ounces (0.9 kg). 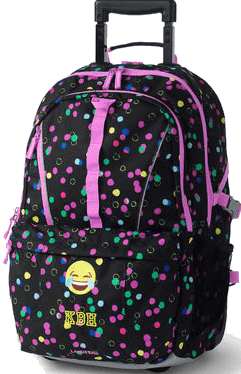 The Lands’ End Wheeled Backpack with (extra) emoji and monogram options. Lands’ End also offers a well-built children’s rolling backpack that is a bit cheaper than L.L. 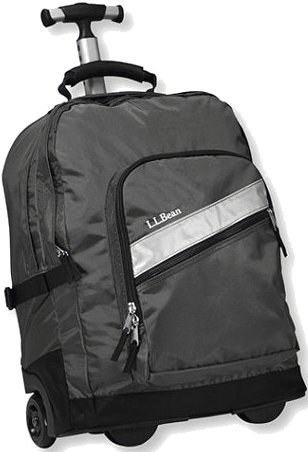 Bean’s and offers mainly the same features: the Lands’ End Classmate Large Wheeled Backpack. The drawback is that we can’t expect it to hold up as well as L.L. Bean’s wheeled backpack discussed above. Reviewers who tested this and other children’s Lands’ End backpacks found them to be generally well built but with some parts that didn’t hold up as well over the long term. Lands’ End uses 600D polyester for the body and 1200D polyester for the base, which have the advantage of being lighter but do not hold up quite as well as the nylon material employed by L.L. Bean. 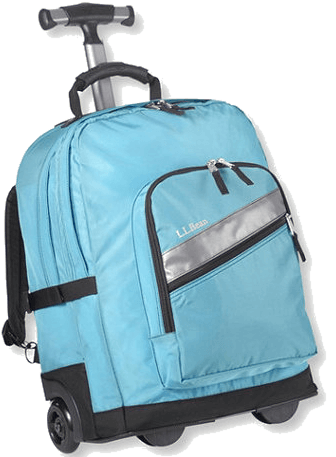 The Lands’ End Classmate Large Wheeled Backpack also has a reflective patch for visibility, two smaller front pockets, and a solid guarantee with a history of good follow-up. It measures 18 x 13 x 9 inches (45.7 x 33 x 22.9 cm) and has a capacity of 27.8L. 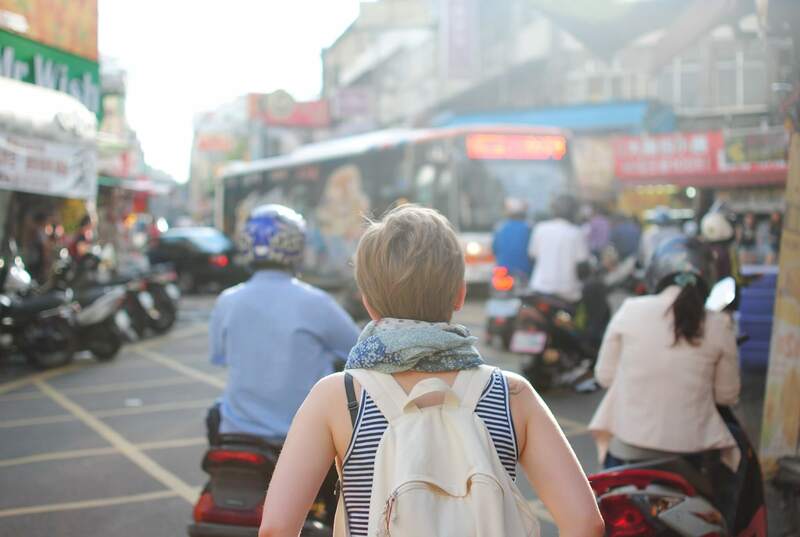 While some of these backpacks are cheaper than our main recommendation at the top, we think their overall cost will be greater for most people as the bags inevitably wear out. But if you have a kid who treats their things quite delicately, or who is more likely to lose rather than abuse their backpack, a cheaper option might well be worth considering. JWorld New York offers two very reasonably priced kids’ rolling backpack options. They have reflective strips for visibility and are made of the same 600D polyester as the Lands’ End option, offering reasonable water resistance. They’ve garnered a few positive web reviews and their Amazon reviews are mainly positive, although some users note problems with durability and the construction quality certainly does not approach that of our main picks above. The J World New York Sundance Laptop Rolling Backpack is the slightly larger of the two and can old a laptop in its padded sleeve — a rarity for children’s backpacks. It measures 20 x 13 x 9 inches (50.8 x 33 x 22.9 cm) with the 38.3L capacity and is also available from eBags. The J World New York Sunrise Rolling Backpack is just a bit shorter and is cheaper and lacks the laptop sleeve. It measures 18 x 13 x 9 inches (45.7 x 33 x 22.9 cm), has a 34.5L capacity, and can also be found on eBags. The Rockland 17″ Roadster Rolling Backpack was the cheapest option we found, but many of its Amazon reviewers complained of the bag’s wheels and handles giving out after just a few weeks. It is available in a huge range of colors and printed designs. The backpack measures 13 x 10 x 17 inches (33 x 25.4 x 43.2 cm). It’s also available from Target and eBags. 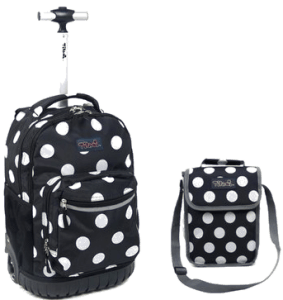 The HollyHOME Wheeled 17″ Rolling Backpack comes in quite relaxing plain colors. 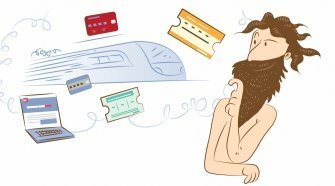 Its few Amazon reviews are mainly positive but likely unreliable, and there’s a dearth of commentary elsewhere. The bag measures 17.3 x 8.7 x 11.8 inches (43.9 x 22.1 x 30 cm). There is also a 19″ version that has a laptop sleeve, although it’s a bit oddly placed on the front flap rather than the back as with most backpacks, and may not offer as much protection. This version is 18.9 x 7.5 x 13.8 inches (48 x 19 x 35.1 cm). JanSport offers two rolling backpacks that are suitable for kids. Both are solidly built from 600D polyester (though not the tougher 420D nylon employed for our main pick above). This is the top-selling American brand for school bags and its other bags got great (if not top) marks from the French consumer testing organization and reviewers. The JanSport lifetime warranty is excellent. These bags did not win out over our main pick because they’re a bit more expensive for slightly less durable material, but they really are fantastic and can be expected to hold up quite well over time. And if your child needs a laptop sleeve in a rolling daily backpack, the Driver 8 would be the best choice. The JanSport Driver 8 Backpack is the slightly larger and more expensive of the two and is the one that includes a padded sleeve for up to 15″ laptops. The handle has two locking stages so it can be comfortable to pull for both children and adults. The backpack straps tuck away when not in use. There are two large main compartments, a front organizer pocket, and a water bottle pocket. 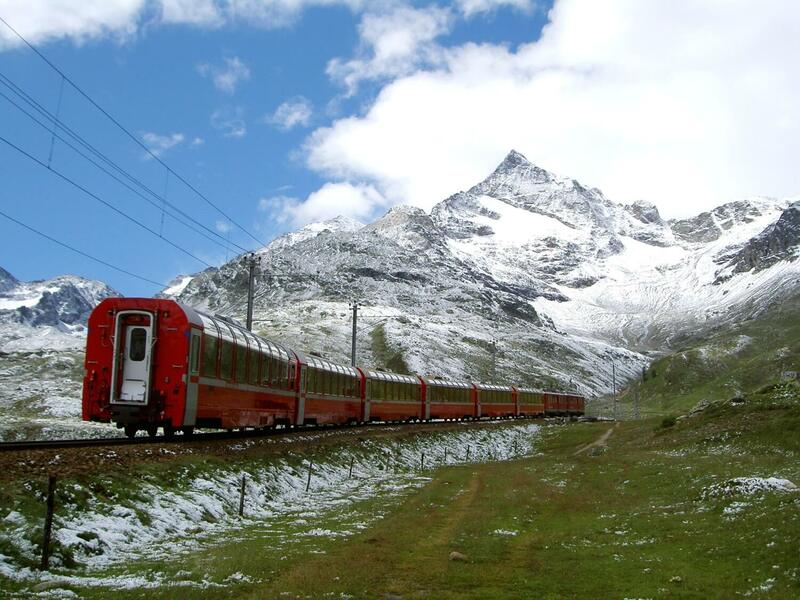 It measures 21 x 14 x 10 inches (53.3 x 35.6 x 25.4 cm) and has a 36 L capacity. It is also available from JanSport, Zappos and eBags. The JanSport Superbreak Backpack is a slightly simpler affair with just one big main compartment and one front organizer pocket. The handle locks at three levels. It measures 19 x 13 x 9.5 inches (48.3 x 33 x 24.1 cm) and has a capacity of 33L. It is also available from JanSport, Zappos and eBags. We’re not sure about the construction of this bag but the exposed zippers (no covering flap) don’t suggest that forethought has been given to rain, and you’re not exactly saving money here. There is, however, an included matching lunch bag. 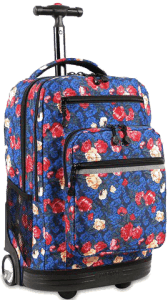 The Tilami Rolling Backpack is available in a wide range of wild printed designs. It measures 19.2 x 13.6 x 9.8 inches (48.8 x 34.5 x 24.9 cm). Overall, the best children’s rolling backpack is the incredibly durable L.L. Bean Rolling Deluxe Book Pack. Our second choice is the somewhat cheaper but still high quality Lands’ End Classmate Large Wheeled Backpack. If your child carries a laptop or tablet, the best choice is the JanSport Driver 8 Backpack. And for a very cheap option that also has a laptop sleeve, go for the J World New York Sundance Laptop Rolling Backpack. 1. ⇧ While D or “denier” is a measure of density of the fabric, it is only relevant as a measure of strength among the same types of fabric — and not when comparing different fabrics to each other.